In a hurry for pumpkin pie? Try this easy recipe and you'll have a home baked pie in no time. 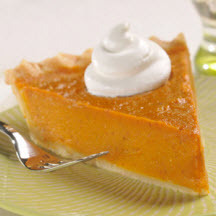 Mix pumpkin pie mix, evaporated milk and eggs in large bowl. Pour into unbaked pie shell. Bake in preheated 425°F (220°C). oven for 15 minutes. Reduce temperature to 350°F (175°C); bake 50 to 60 minutes or until knife inserted near center comes out clean. Note: Do not freeze, as this will cause the crust to separate from the filling. For High Altitude Baking: (6,000 ft.): Deep-dish pie - extend second baking time to 55 to 65 minutes. Shallow pies - no change needed.